Welcome to Brad's Yankees Greats Page. Beginning with Lou Gehrig’s number 4 in 1939, the Yankees have retired 20 uniform numbers to honor 22 players and managers. Born: May 16, 1928 in Berkeley, CA. Died: December 25, 1989 in Binghamton, NY. Born: February 6, 1895 in Baltimore, MD. Died: August 16, 1948 in New York, NY. Baseball’s greatest slugger and the most colorful figure in the game’s history. Debuted as a pitcher for the Boston Red Sox, winning 89 games over six seasons before being converted to the outfield because of his tremendous power. Was sold to the Yankees for $120,000 in 1920 and his 54 home runs that year were more than any other American-League team. En- route to 714 career home runs, won 12 home run titles, hitting 60 in 1927. Added 15 home runs in World Series competition as he led the Yankees to seven Series appearances and four World titles. A member of the inaugural class of Hall of Fame inductees in 1936. Born: June 19, 1903 in New York, NY. Died: June 2, 1941 in Riverdale, NY. Durable, power hitting first baseman who played in an amazing 2,130 consecutive games between 1925 and 1939. Drove in at least 100 runs for 13 straight seasons (1926-38) and established an American-League record with 184 RBI in 1931. Compiled a .340 lifetime batting average and belted 493 home runs in a career shortened by terminal illness. Was honored at Yankee Stadium on July 4, 1939 and made memorable “Today, I consider myself the luckiest man on the face of the earth” speech. Life was immortalized in classic 1942 motion picture, The Pride of the Yankees, starring Gary Cooper. Amazingly, Lou Gehrig stole home 15 times in his Yankees career. He was elected to the Hall of Fame in 1939. Born: November 25, 1914 in Martinez, CA. Died: March 8, 1999 in Hollywood, FL. The “Yankee Clipper” is considered by many experts as the best all-around baseball player in history. Was a sensational hitter for average and power, a splendid, graceful, ball-hawking center fielder with a powerfully accurate arm and a daring and alert base runner. Compiled a .325 lifetime batting average from 1936 to 1951. The two-time batting champion and three-time MVP powered the Yankees to the first of four consecutive World Championships in his 1936 rookie season. Many rate his 56-consecutive-game batting streak in 1941 as the top baseball feat of all time. Elected to the Hall of Fame in 1955. Born: July 18, 1940 in Brooklyn, NY. Threw right-handed and batted right-handed. His calm approach and dignified manner provided the foundations for one of the most successful eras in franchise history. Managed the Yankees to a 1,173-767-2 regular season record and 76-47 postseason mark. Leading the club to the playoffs in each of his 12 seasons at the helm. In 1998, guided the team to 125 total victories. The most single-season wins by any team all-time. Elected to the Hall of Fame in 2014. Born: October 20, 1931 in Spavinaw, OK.
Died: August 14, 1995 in Dallas, TX. Threw right and switch hit. Number retired in 1969. “The Mick” was the most feared hitter on the most successful team in history. In his best seasons, and there were many, Mantle was simply a devastating player. He could run like the wind and hit tape measure homers, like his famous 565-footer in Washington in 1953. He led the Yanks to 12 fall classics in 14 years, and seven World Championships. He still owns records for most homers, RBI, runs, walks, and strikeouts in World Series play. In 1956, Mantle had one of the greatest seasons ever at the plate. He hit 52 homers with 130 RBI and a .353 average to win the Triple Crown. Mantle was elected to the Hall of Fame in 1974. Born: May 12, 1925 in St. Louis, MO. Threw right-handed and batted left-handed. Born: June 6, 1907 in Bastrop, LA. Regarded as one of the greatest catchers of all-time. A durable and tireless worker, he caught more than 100 games in 13 consecutive seasons (1929-41), an American-League record. He did not allow a single passed ball in 125 games behind the plate, another AL record. Dickey also excelled at the plate, batting over .300 in 10 of his first 11 seasons while hitting 202 homers during his career. He handled Yankee pitching staffs on eight World Series teams, winning seven championships. Born: September 10, 1934 in Hibbing, MN. Died: December 14, 1985 in Houston, TX. Batted left-handed and threw right-handed. In one of the most dramatic assaults on a baseball record, Maris caught, then surpassed Babe Ruth's famous home run record of 60. In 1961, Maris hit 61 home runs, a Major-League record which stood until 1998.The two-time American League MVP (1960-'61) is also considered as one of the best fielding right fielders in Yankee history. Born: September 25, 1917 in New York, NY. Playing 13 years for the Yanks, “Scooter” went to the World Series in 10 of those seasons. That stat may best explain why the diminutive shortstop is regarded as a true Yankee legend. He was a durable, outstanding shortstop, skilled bunter and enthusiastic base runner with a solid .273 lifetime batting average. In 1950 Rizzuto earned the A.L. MVP Award, batting .324 with 200 hits, 92 bases on balls, and 125 runs scored. He batted .320 in the 1951 World Series and was named Series’ MVP. Spent 40 years as a Yankee broadcaster (1957-96). Elected to the Hall of Fame in 1994. Born: June 7, 1947 in Akron, OH. Died: August 2, 1979 in Canton, OH. Was the undisputed leader and most respected man on the Yankee teams that won three AL pennants in a row (1976-78) and two World Championships. Munson was a tremendous defensive catcher, winning the Gold Glove Award in three consecutive seasons (1973-75). From 1975-77, Thurman drove in more than 100 runs and hit better than .300 in each of those three seasons. He hit the first Yankee home run in the “new” Yankee Stadium. There is no more tragic date in Yankee history than August 2, 1979. On that date Munson passed away when the plane he was flying crashed while landing. Born: October 21, 1928 in New York, NY. “The Chairman of the Board” was the ace pitcher on the great Yankee teams of the 1950’s and early 60’s. The wily southpaw’s lifetime record of 236-106 gives him the best percentage (.690) of any 20th century pitcher. He paced the American League in victories three times, and in ERA and shutouts twice. The 1961 Cy Young Award winner still holds many World Series records, including 10 wins, 33 consecutive scoreless innings and 94 strikeouts. Elected to the Hall of Fame in 1974. Threw right and batted both. “A MEMBER OF FIVE WORLD CHAMPIONSHIP TEAMS AND A FIVE-TIME SILVER SLUGGER AWARD-WINNER, POSADA WAS A HOMEGROWN YANKEE, PLAYING ALL 17 OF HIS MAJOR LEAGUE SEASONS IN PINSTRIPES. CONTINUING THE LEGACY OF GREAT YANKEES CATCHERS, HE APPEARED IN 1,829 GAMES, COMPILING A .273 BATTING AVERAGE, WITH 275 CAREER HOME RUNS, 1,065 RBI, AND A .374 ON-BASE PERCENTAGE. THE FIVE-TIME ALL-STAR SET CAREER HIGHS WITH 30 HOME RUNS AND 101 RBI IN 2003, FINISHING THIRD IN AL MVP VOTING AND MATCHING YOGI BERRA'S SINGLE-SEASON RECORD FOR MOST HOME RUNS BY A YANKEES CATCHER. IN 2007, POSADA HAD A HISTORIC SEASON, BATTING .338, WITH 20 HOME RUNS, 90 RBI, 42 DOUBLES, AND A .426 ON-BASE PERCENTAGE." Born: April 20, 1961 in Evansville, IN. Born: February 23, 1929 in St. Louis, MO. Died: December 14, 1980 in New York, NY. Became the first black player in Yankee history when he made the club in the spring of 1955. The versatile two-time Gold Glove catcher was an important member of the A.L. pennant-winning Yankee teams in nine of his first ten seasons with the club. The 1963 American League MVP, Howard was a clubhouse leader who was respected as both a player and a man. 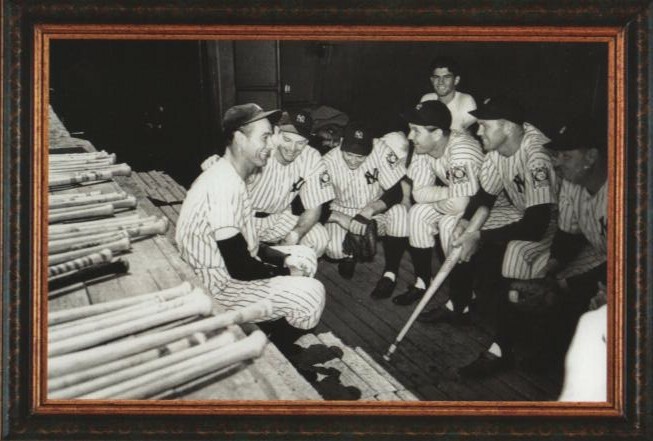 Howard’s dignified manner off the field and competitive spirit on the field were positive influences on the Yankee team. Born: July 30, 1889 in Kansas City, MO. Died: September 29, 1975 in Glendale, CA. In a distinguished 54-year professional career, “The Old Professor” emerged as one of the game’s greatest managers. His feat of guiding the Yankees to 10 pennants and seven world titles in a 12-year span ranks as the top managerial accomplishment of all time. Simply put, Casey Stengel was one of the best things to ever happen to the game of baseball. He was an authentic baseball ambassador, making the game fun for millions of Americans. Elected to the Hall of Fame in 1966. His final game was September 26, 2013. ""Mo" is considered the greatest closer in baseball history. He spent his entire career in pinstripes from 1995-2013 and became the franchise leader in games pitched. Thriving under pressure, he ammassed the most saves in postseason history. A 13-Time All-Star, he retired as baseball's all-time saves leader." Born: May 18, 1946 in Wyncote, PA.
One of the game’s premier power hitters, “Mr. October” blasted 563 career round trippers, sixth all-time. In Game Six of the 1977 World Series, Jackson hit three home runs, all on the first pitch, as the Yankees beat the Dodgers to wrap up the club’s first World Championship since 1962. Jackson was an exciting clutch player and an intimidating clean-up hitter with a .490 career slugging percentage. The 1973 American League MVP once said, “Some people call October a time of pressure. I call it a time of character.” Elected to the Hall of Fame in 1993. “A FIVE-TIME WORLD CHAMPION AND THREE-TIME ALL-STAR, PETTITTE WAS A MODEL OF CONSISTENCY IN THE YANKEES ROTATION FOR 15 SEASONS, GOING 219-127 (.633) AND TYING THE FRANCHISE RECORD OF 438 STARTS. KNOWN FOR HAVING ONE OF BASEBALL'S BEST PICKOFF MOVES, PETTITTE WILL BE MOST REMEMBERED FOR HIS EXTENSIVE OCTOBER RESUME, AS HE WENT 18-10 WITH A 3.76 era IN 40-POSTSEASON STARTS WITH THE CLUB. IN 2009, HE BECAME THE FIRST PITCHER TO START AND WIN THE CLINCHING GAME IN EACH OF THREE SERIES IN A SINGLE POSTSEASON. THE LEFTHANDER RETIRED WITH THE THRID HIGHEST WIN TOTAL IN FRANCHISE HISTORY, AND HE IS THE CLUB'S ALL-TIME STRIKEOUT LEADER, WITH 2,020. TWICE A 20-GAME WINNER, PETTITTE FINISHED HIS CAREER AS THE FIRST PLAYER TO PITCH MORE THAN 15 SEASONS IN THE MAJORS WITHOUT EVER HAVING A LOSING RECORD." “A dominating pitcher and a respected leader of the pitching staff for three American League pennants and two world championships. A true Yankee.” The slender lefty with the biting slider spent his entire 14-year career with New York, winning 170 games from 1975-88 — which ranks fourth on the team’s career list. He helped the Yankees win World Series titles in 1977 and ’78. A four-time All-Star, Guidry had one of the greatest seasons ever for a pitcher in 1978, when he went 25-3 with a 1.74 ERA, nine shutouts and 248 strikeouts en route to the AL Cy Young Award. He struck out a club-record 18 batters June 17 that year against the California Angels." “A FOUR-TIME WORLD CHAMPION, FIVE-TIME ALL-STAR, AND FOUR-TIME GOLD GLOVE AWARD WINNER. WILLIAMS RETIRED AS BASEBALL'S ALL-TIME LEADER WITH 80 POSTSEASON RBI. HIS 1996 ALCS MVP PERFORMANCE AGAINST BALTIMORE PROPELLED THE YANKEES TO THEIR FIRST FALL CLASSIC IN 15 YEARS. DURING THE YANKEES' 114-WIN SEASON IN 1998, WILLIAMS HIT .339 TO BECOME THE FIRST MAJOR LEAGUER TO WIN A BATTLE TITLE, GOLD GLOVE AWARD, AND WORLD SERIES RING IN THE SAME YEAR. A LIFETIME YANKEE, HE FINISHED HIS CAREER WITH 287 HOME RUNS, 1,257 RBI, 2,336 HITS, 449 DOUBLES, AND 1,069 WALKS IN 2,076 GAMES - AMONG THE FRANCHISE'S TOP SEVEN IN EACH CATEGORY AT THE TIME OF INDUCTION."